Npower recruited Wallace and Gromit to join them in the Back The Bid campaign to host the FIFA World campaign in England in 2018. As part of this bid Npower are also offering people the chance to win free home energy until 2018 worth up to £1250 per year, available online at www.npower.com/handofdog. The Hand of Dog name comes from the 1986 incident in which Maradona proclaimed that the Hand of God knocked England out of the FIFA World Cup. Now Wallace and Gromit exact revenge with their madcap pie-making business “WAG’s Pies Ltd”. As usual, their best-laid plans are threatened when Wallace’s latest invention, a pie delivery machine, threatens the game with an errant pie. The 30 second format will be shown on national television. There is also a 40 second clip available exclusively online that features the unforgettable and original 1966 script and voiceover, which declares “They think it’s all over…it is now!”. The Hand of Dog campaign was developed at VCCP, London, and Aardman Animations. The commercial took 3 ½ weeks to shoot. The commercial features Bob the engineer from previous npower commercials, and the smart meter from “widescreen” is featured in the pie hut. The team colours were blue & white and red & white to reflect the colours in the new npower logo. The crowd features supporters of both teams to show a harmonious atmosphere. The pitch was made by painting towel fabric. This created a great replica of turf on a football pitch. The newspaper that Gromit is reading in the final shot has articles which mention npower staff, agency personnel and Aardman crew. The initial stadium shot was used by shooting a miniature stadium with several streets dressed onto the set. These were then duplicated in post production to create a whole environment. Several elements were added in post production to make the shot “come alive”. These included adding players, a crowd, camera flashes, clouds and flags as well as moving traffic. The pie machine, built by John Wright Modelmaking, has been dressed to make it look as if it’s been built by Wallace and has been used already, which makes it fit into their world better. It features a “special delivery” barrel, slots for the pie tins to shoot out of (as if they are shot cartridges), magazines full of pies, and a scope to seek out customers. The scope on the pie machine is fully animatable and can be moved into several angles. The black surround of the binoculars was made by painting fabric plasters which created a realistic texture. The shot featuring Bob waving to Wallace was created by mixing stop motion animation of the characters, then adding a “scope” effect with crosshairs in CGI. The camera move and focus pull were also completed in post production. The shot of Gromit sliding down the rails was produced by compositing several layers together. These included the primary animation of Gromit, together with several layers of crowd characters and the stadium in the background. 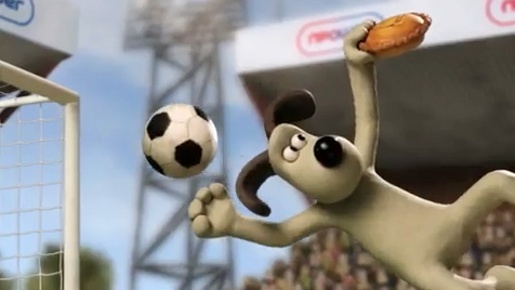 The animation of Gromit catching the pie / knocking the ball was shot and edited using a mixture of normal speed and slow motion.